Rainbow Honey Magic Cake, Tessie and Mint Flavor! WOW. So. June is half way over. Where is the time going? At any rate, I feel like I'm falling so behind when blogging. I'm going to try to do better as the summer goes on - starting today! 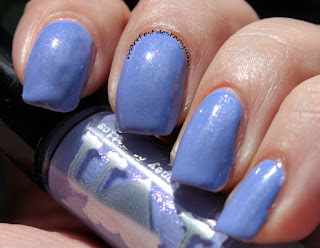 I bring you three shades from the Summer of 199X collection from Rainbow Honey! I'm just going to jump right in with my favorite, favorite, favorite of this trio - MAGIC CAKE! A while back in my quest for a neon glitter topper, I attempted to make one - Alien Blast. It looked great for a few days....then the glitter bled and it became a hot mess of grey grossness. So color me ecstatic when I saw Magic Cake in this collection! 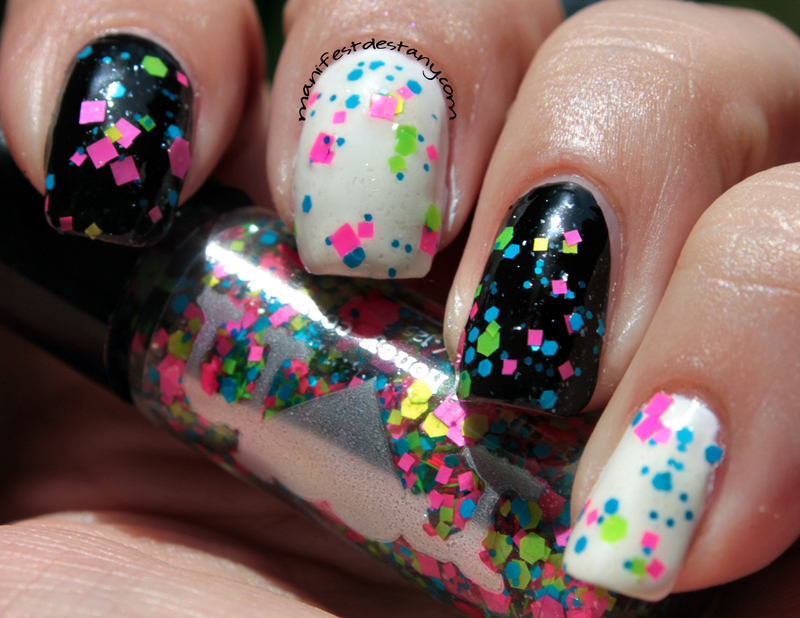 The green, pink and blue glitters are amazing! I tried it out first over black and white polishes (pictured above), and while I liked the combos, I couldn't help but think there was a better one out there - enter NYC Boat Basin, a polish I picked up at Rite Aid on clearance for 69 cents! That's the combo I was looking for! How lovely is that?? I am wearing this today. 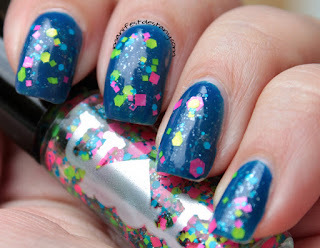 The glitters really bring out the gorgeous blue, and the blue is the perfect backdrop for the glitters! 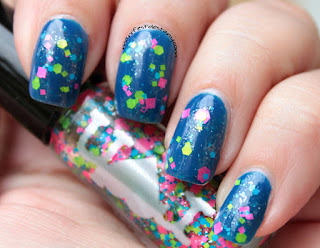 I can't say enough great things about this glitter (and this combo hehe). The formula isn't too thick, and I didn't have to dab my glitters on, which I love. I just swiped the brush across the nail. Great formula, great coverage. 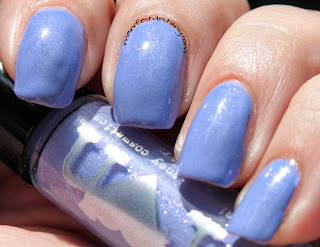 Now on to Tessie, a periwinkle creme with a gorgeous blue shimmer running through it. I'm wearing two coats in these photos. The shimmer isn't as apparent in the sun as it is in the shade. The formula on this one was a tad on the thick side, but not so much that it was hard to use. I just had to be careful with thickness of each coat (see my pointer finger - it looks kinda gummy). The color is beautiful! And on to Mint Flavor. It looks WAY blue until you have it up against something blue, then it's the minty-est color ever! haha The formula wasn't as thick as Tessie, which made it easier to apply. It's such a rich, creamy color. I can see myself wearing this over and over :) I'm wearing two coats in these photos. 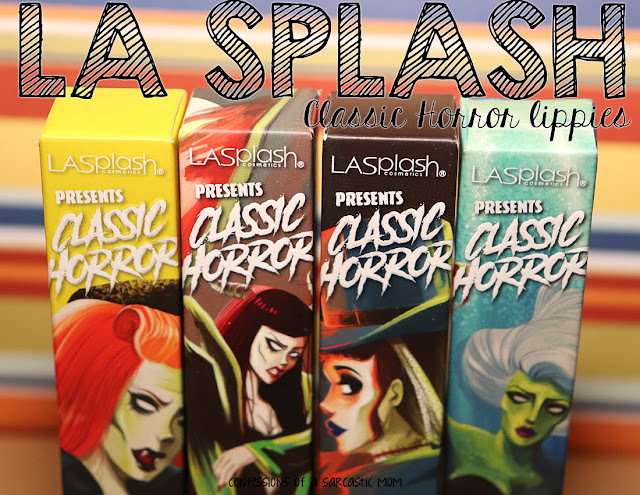 You can purchase these colors, and every other in this collection here, from $10 per bottle. You can purchase sets of colors, or you can buy individually. You can follow Rainbow Honey on Facebook, Twitter and Instragram.